Chuck D got on Twitter Sunday and articulated the argument that's been had in many Facebook news feeds and Twitter timelines since the Bill Cosby sexual assault stories broke: Do we throw away the baby with the bathwater when talking about Bill Cosby, his contributions to American culture and the allegations? The Public Enemy rapper said that while he's not defending Cosby against claims that he drugged women in order to sexually assault them, the rapper pointed out that Phil Spector, a musician who was convicted in 2009 of killing his wife, still retains some kind of support from Americans who play his music. He went on to reference Marvin Gaye—a beloved American musician—while using the same argument: that Gaye also committed heinous acts, and yet his contribution to society, his music, is still celebrated and appreciated. Chuck D rhetorically asked if organizations would be willing to give back the money that Cosby has donated over the years, presumably to make the point that we can't undo all the good that Cosby has done, or completely dissociate ourselves from his work. He also tweeted about all the backlash he's been getting from folks who think that he's somehow corralling support for Cosby. 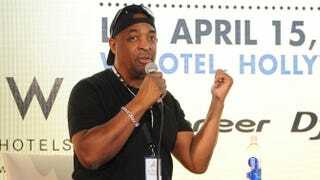 Although Chuck D's views are his own, he was then labeled a Cosby defender by those on Twitter. People rightfully feel passionately about this issue, so he had to know what he was getting himself into.